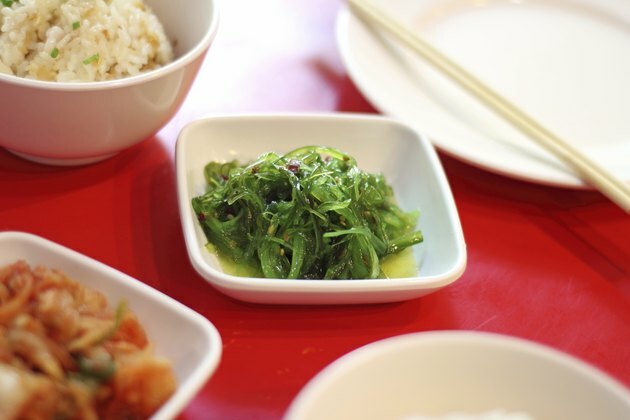 Kelp is a type of seaweed known for its rich iodine content. It is available as a dietary supplement in the form of capsules, powder and teas. It is commonly marketed for thyroid support. You should use caution when taking kelp supplements. Excess iodine from kelp can cause adverse health effects. Consult your doctor before taking kelp supplements. Iodine is a trace mineral, and your body requires only a small amount. According to the University of Maryland Medical Center, the recommended dietary iodine intake for people over 10 years old is 120 to 150 mcg per day. Your thyroid contains about 70 to 80 percent of the iodine found in your body. Your muscles, ovaries and blood contain the rest. Your body produces no iodine, so it must come from your diet. Shellfish, kelp and deep water fish contain iodine. However, iodized salt is the primary source of iodine in your diet. Your thyroid is a small endocrine gland found in the front of your neck. It produces thyroid hormones from iodine and the amino acid tyrosine. Thyroid hormones control your metabolism. When your thyroid produces too little hormone, it is called hypothyroidism. When it produces too much hormone, it is known as hyperthyroidism, or thyrotoxicosis. Hypothyroid symptoms include fatigue, weight gain and constipation. Hyperthyroid symptoms include weight loss, hair loss, irritability and frequent bowel movements. Excess iodine from kelp or other dietary sources can adversely effect your thyroid. According to a case report published in the June 2006 issue of the "Journal of General Internal Medicine," a woman experienced iodine-induced thyrotoxicosis from consuming a kelp-containing tea. She consumed an estimated 580 to 990 mcg of iodine from the kelp tea daily for one month. Antithyroid medication helped bring her thyroid hormones into a normal range. Since being added to salt, iodine deficiency is uncommon. Taking kelp specifically for its iodine content is considered unnecessary. Men in the United States between age 25 to 30 consume iodine at an estimated 410 mcg per day. Women between the same age consume about 260 mcg per day. The iodine level from kelp needed to cause overdose will vary from person to person depending on individual physiological factors. Your thyroid uses a complex system to deal with excess iodine. Consult your doctor before supplementing kelp.